I am bursting with pride for my union. The Seattle Education Association voted at this week’s Representative Assembly to support a resolution calling for a moratorium on all standardized testing! This vote comes in a long line of organizing and opposition to high-stakes testing in Seattle. In 2013, the teachers at Garfield High School voted unanimously to refuse to administer the MAP test. The boycott spread to several other schools in Seattle. When the superintendent threatened the boycotting teachers with a 10 day suspension without pay, none of the teachers backed down. At the end of the year, because of the overwhelming solidarity from parents, teachers, and students around the country, not only were no teachers disciplined, but the superintended announced that the MAP test would no longer be required for Seattle’s high schools. In the subsequent years we have seen the movement continue to develop with Nathan Hale High School achieving a 100% opt out rate of the junior class of the Smarter Balance test in 2015, with some 60,000 families opting their kids out of the common core test around Washington State. Despite these heroic efforts to stand up to the testocracy, they are still trying to reduce teaching a learning to a score and use that score to punish students. Thousands of students will not graduate from high school across Washington State simply because they didn’t pass the common core test. The average student in the public schools in the U.S. takes an outlandish 112 standardized tests in the K-12 career–forcing teachers to teach to the test, rather than teach to the student. Study after study has reveled that these tests are a better measure of family income than aptitude. These test measure resources and your proximity to the dominant culture, negatively impacting English Language Learners, special education students, students of color, and low income students. The most exciting aspect of the moratorium is the number of possibilities it opens. The removal of testing from our practice means that there is more time to dedicate to “non-standard” curriculum for example. This opens the possibility of more interdisciplinary problem based learning. It opens the possibility of alternative assessments that more readily capture the diverse brilliance of our student population. The positive impact on curriculum includes actually being able to create culturally responsive classrooms. Beyond curriculum there are some other possibilities. It opens the possibility of a windfall for the district budget as funds will not be needed to pay for the testing services. It also provides leverage in the upcoming bargain with a message that says we are serious about this work. There are some features of the structure of the resolution that need to be highlighted. It has no specified start time which leaves some flexibility when negotiating with the Seattle Public Schools. The resolution gives teachers more power in curriculum decision making. The structure of the forums is left open because they would be complex logistical activities requiring a lot of organizing and the resolution does not want to limit the scope of the team that would work on them. The method for gathering data on assessment innovations is also complex and requires a lot of work, so it too is left open. This is not argument that leads to lower expectations and the removal of all standards. In fact the exact opposite is true; this would help us raise expectations and add enough standards to assess every individual according to their agreed upon set of standards. This is the way to customize education to serve the needs of such diversity in our student body. Finally, this moratorium is a clear indictment of and pointed action against systemic racism. the SEA RA and the Seattle School Board have each unanimously approved resolutions in support of ethnic studies which are significantly hindered by the Eurocentric content and practices of standardized testing. test results reinforce the sense of entitlement for high scorers, the sense of worthlessness in low scorers and the sense of mediocrity for those in the middle. Since test results correlate most strongly with economic status, their use as an indicator of achievement or potential is completely invalid. they introduce unhealthy levels of stress into the school environment. This is true for every single member of the school community. It contradicts any goals of reducing stress levels to improve learning. There is already enough stress built into growing up. We don’t need to add more. they reduce the learning experience to mere curriculum based on standards generated by distant technocrats. We have students taking two and three math and reading classes of the most crushingly boring type of rote learning instead of art, dance, expeditionary or experiential learning etc, in order to boost test scores. SPS and SEA have joined together to form race and equity teams across the district that recognize the barrier created by standardized testing and how it provides unequal results based on race and class. years have passed since the WEA and the NEA launched campaigns to end toxic testing. the King County NAACP resolved on April 15, 2016 to “strongly advocate for a multiple measures qualitative and quantitative community-based dashboard approaches to evaluate the success of states, district schools, teachers and students without the primary or majority focus being a high-stakes standardized exam” and to “support parents who decide to opt-out of testing as a social protest”. standardized testing has and continues to degrade professionalism in our teaching corps. Therefore be it resolved that SEA call for a two year moratorium on all standardized testing, at the district, state, and federal levels and to open a public forum along with SPS on the best way to assess our students. Teachers will not be compelled to assess their students using any 3rd party assessment tools. Be it further resolved that SEA will work with SPS to create waivers. Waivers may be needed during the moratorium for students barred from graduation due to state testing requirements, schools denied Title 1 funding and other reasons. Ongoing work to delink high school graduation requirements from testing will continue. The moratorium will be considered a period of action research which will inform strategic planning for the authentic assessment of Seattle students. #SayHerName: One year ago, Seattle Police Killed Charleena Lyles and we wont stop the struggle until there is justice! Study after study has revealed that these tests are a better measure of family income than aptitude. These test measure resources and your proximity to the dominant culture, negatively impacting English Language Learners, special education students, students of color, and low income students. For decades teachers have been treated with great disrespect and they had tried as much as possibly simply to comply. There have been times when teachers were fired, principals fired, when they did not live up to the demands placed on them. Over time, decades, they have slowly fought back and this has reached the point where they have lifted up their level of organization in fighting against the inequitable conditions imposed on them. 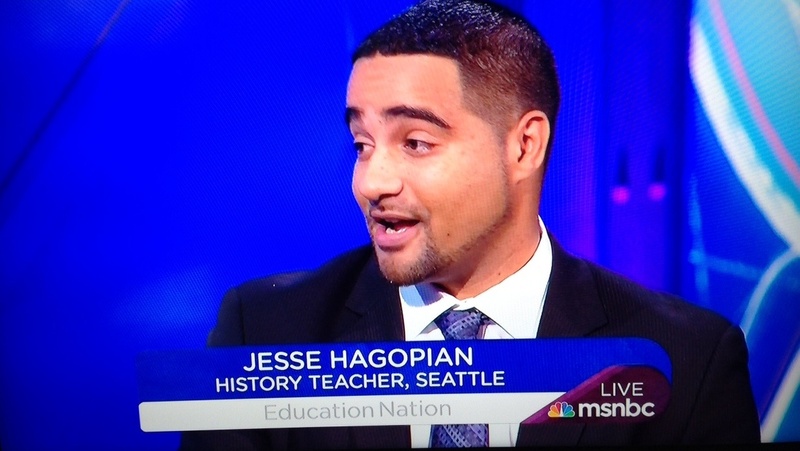 This is a good thing, as a result we are seeing teachers running for political office. Big business has a different point of view about education and it runs harshly contrary to the educators’ much more reasonable perspective of what an education is supposed to provide, a developed human being. Tests are made to assess students and when they become, as they seem to do presently, a thing in themselves, they are more destructive than useful. Countries such as Finland realized that tests must be guided and done by the teachers, who use it in accomplishing limited goals. That teachers are finally asserting themselves, after accepting such punishing treatment, is a good thing for then the discourse changes takes on its needed emphasis; how do we find ways to meet the needs of teachers in providing a valued education for all our students, instead of trying to force teachers to do the impossible. We have nothing but praise that teachers are standing up for they will alter the equation considerably and ultimately lead to a sensible way of addressing the educational needs of our students. And that folks is prima facia evidence that through the state sanctioned testing regime the state, through its schools is unconstitutionally discriminating against some students due to inherent characteristics/capabilities. The state is not allowed to discriminate against other innate characteristics such as skin color, gender, disability and even non-innate religious beliefs. Why the hell is the state allowed to discriminate via mental capabilities rewarding some students and castigating, as with those above-mentioned thousands of students? Especially considering the discriminating device, standardized tests have are rife with onto-epistemological errors and falsehoods and psychometric fudgings that render the usage of the results of said testing to be completely invalid. I can guarantee that some students will be denied that graduation because of the many errors in the standards and testing regime process. It can’t be denied. One more, both are a little long but I can’t say it any more succinctly. In the graphic it states: “Multiple choice & short answer tests are poor measures of student achievement*”. “Measures” and “student achievement” are the language of the edudeformers and privateers. Until we quit using their language and begin substituting more straight forward language that explicity explains what we mean, we’ll continue to lose the battle for public schools. “The most misleading concept/term in education is “measuring student achievement” or “measuring student learning”. The concept has been misleading educators into deluding themselves that the teaching and learning process can be analyzed/assessed using “scientific” methods which are actually pseudo-scientific at best and at worst a complete bastardization of rationo-logical thinking and language usage. Finally, what the proponents of the educational standards and standardized testing regime don’t appear to understand is that in many areas of human feelings and interactions there cannot be any measurement. How does one measure the love of one’s spouse, children, parents or friends? How does one measure what is going on in the heart and mind of a distressed person who has just lost a loved one? Why do we even begin to think that we can measure what goes on in the body and brain of the student who is learning any subject matter considering all the various hormonal and endocrinal influences occurring outside the individual’s control, with the hundreds of millions if not billions of neuronal firings going on at any given moment that partially influence what happens in the mind of the student in a teaching and learning situation? How do we believe that the thousands and thousands of environmental influences on each individual could begin to be measured and accounted for? Are proponents of the educational standards and standardized testing “measurement” regime that arrogant, hubristic and presumptuous to believe that they hold the key to measuring the teaching and learning process or more specifically, the learning, aka, student achievement, of an individual student? *Never gave a damn about “student achievement”. I cared about whether the student was learning as much as she/he wanted to and could. Pingback: The Racially Coded Language in “Closing Opportunity Gaps” – Thoughts on Racial Justice from an "Activist Teacher"
Bravo, what an informative post that points out a real issue! Standardized test have been a problematic to me for a while now. This subject needs that proper exposure, so that we can start taking action and fix it. We at Irrigation repair Seattle thank you for the post for doing just that. What an informative article you have shared. It helped me increase my knowledge on this topic. Keep Sharing!